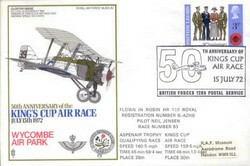 Cover produced to commemorate the 80th Anniversary of RAF Waddington in June 1996. Cover artwork by Tony Theobald depicts some of the aircraft that have been based over the years at RAF Waddington, those shown are; BE 2c biplane , Avro Lancaster , Avro Vulcan , BAe Nimrod and Boeing E-3D Sentry along with the station badge. 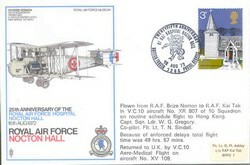 The cover was issued at the RAF Waddington Air Show in June 1996 as part of the 80th Anniversary celebrations. The cover bears Rowland Hill Penny Post 19p stamp cancelled with BFPS 2526 postmark for the 80th Anniversary of RAF Waddington on 29 June 1996 and shows the towers of Lincoln Cathedral rising from the mist. 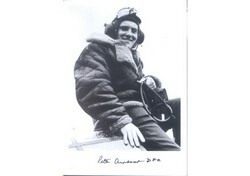 This cover has been flown in Boeing E3-D Sentry ZH 101 of No 8 Squadron on a long range surveillance training sortie.